© 2019 Sun Valley International School. All rights reserved. The School Years are time for growth, challenge and discovery. At Sun Valley, We encourage and prepare students to participate fully, to take risks, to be self advocates and to create lasting memories and relationships with peers and staff. Academic achievement is important because it prepare students for future careers. It also allows students to enter competitive fields. Academic achievement is often a sign of a defined individual which can help students in all area of their lives. In 11 years of its service SVIS has carved a niche for itself in the region for its good academic record. Session 2014-15 withered a 100% pass result in both X and XII boards where the class X 16 students scored a perfect 10 CGPA while 95% was touched in XII science and 11 in XII commerce Our teacher to students relation and individual care helps students to shed their fear and mould themselves before the exams with state of the art labs, and other requisite facilities SVIS provide students with best environment which is conducive for the learning process. Children spend nearly a quarter of their student life in the classrooms. Keeping this in mind our classrooms are spacious and airy providing all facilities and modern teaching aids like computers, internet and facilities for using a LCD projector. Each classroom is specially designed with furniture suitable for individual study as well as group work. It also offers space for storing children's belongings, books and other study material. It includes a dust free writing board, display board, varieties of charts, maps and other visual learning/teaching aids. Class strength is limited to ensure individual guidance and instructions. Books are a vast source of wisdom and knowledge. It is indeed rightly said that the books are a man's best friends. To strengthen this friendship between a child and knowledge, Our school offers a wide range of books in its well-stocked library. 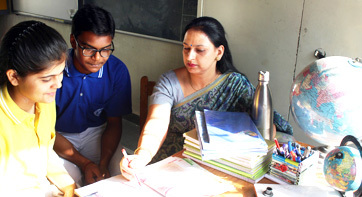 Sun Valley can boast of a Library with books ranging from Text books to Fiction to Encyclopedia. Apart from this a variety of story books and novels adorn the book shelves at our Library. To keep the students abreast with what's going on in the World, about 40 periodicals have been subscribed. To support teaching a learning experiences through multimedia. The library proudly owns CDs for all classes for all subjects. 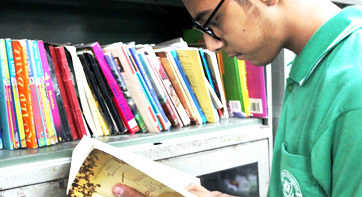 Inquisitive minds are trained to research on the projects assigned to them by searching relevant information from books and multimedia in library. Autobiographies of great men and leaders provide an opportunity to students to draw inspiration from them. Reading habit is further encouraged by allotting library period to each class every week to which the students look forward to enthusiastically.